Media captionOne incident a day of bad behaviour by aircraft passengers is being reported. The number of "air rage" incidents on UK airlines has quadrupled over a three-year period, according to figures seen by the BBC. 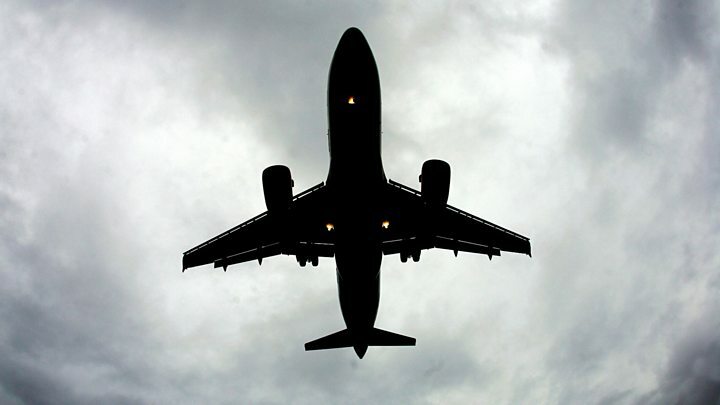 Civil Aviation Authority data shows there were 386 dangerous incidents in 2015 - compared with just 85 in 2013. The head of a leading budget airline has suggested people who cause trouble could be banned by all operators. It is an offence to be drunk on a plane or to refuse to obey instructions given by the captain. Examples of incidents quoted by the CAA include disruptive passengers fighting each other and one passenger who had to be restrained during the flight after "progressively disruptive behaviour" before attempting to open the plane door. It took four policemen to remove one passenger, who was described as "uncontrollable and verbally abusive", in another incident. Growing levels of verbal or physical violence from passengers have been witnessed first-hand by cabin crew member "Dan Air" - the pseudonym used by the writer of the Confessions Of A Trolley Dolly blog. Dan has worked for UK-based airlines for 11 years. "Certainly the last two or three years it's got a lot worse - alcohol-fuelled, drug-fuelled," he said. "People a lot of the time don't actually realise they're on board an aircraft. I think a lot of the time people think that they're in a club or in a bar. "They behave like animals. You can't believe your eyes some of the things that you're seeing. "Now we're getting to the point where we're having to be bouncers." According to Dan, the problems are worst on short-haul destinations to European cities popular with stag and hen parties, although flights to Las Vegas in the US can also be problematic. He said: "It needs to change before someone, be it a crew member or a passenger, gets seriously hurt or worse. "My fear is that it will take something like that to put a final stop to alcohol being sold to the degree that it is inside the airports and on board the aircraft." In July, the aviation minister Lord Ahmad announced he was looking at the way alcohol was sold in airports, but has yet to announce his findings. In the meantime, budget airline Jet 2 has introduced its own ban on in-flight alcohol sales before 08:00 after being forced to divert one its flights earlier this year when a passenger became abusive. However, Jet 2 managing director Phil Ward admitted problems often stemmed from passengers "pre-loading" in airport bars or buying duty-free before the flight. He said: "You can see it every day where people are drinking pints at six in the morning. "I'm not trying to spoil people's holidays at all, but it's not normal to drink a pint at six in the morning and that then manifests itself on board the plane where the alcohol takes a greater effect." Mr Ward's company has banned 22 troublemakers for life already this year, and he would like to see the creation of a centralised database so that anyone who has been punished by a single airline could be barred across the industry. "I think it would act as a very strong deterrent - and, in fact, there is some work with all the airlines together going on to bring that to the table, to see if that can be correctly arranged between us all." He added: "It's not going to happen overnight. "But it's something we've all agreed is a good practical solution, we just need to work out how to do it between us consistently, so that it's managed correctly." Image caption Budget airline Jet 2 banned six "drunken" passengers from its flights after they were rude and aggressive towards staff. More than 250 million passengers pass through UK airports every year, with close to two million flights, so the number of untoward incidents is still relatively small. But figures from the Civil Aviation Authority leave no room for doubt that the problem of passenger misbehaviour is getting worse. They are sent mandatory occurrence reports from every UK airline, identifying occasions where a plane, its crew or passengers are put at risk. Internationally, too, the problem seems to be growing. The International Air Transport Association has seen a growth in the number of reports of unruly passenger incidents every year since 2007, with more than 10,000 reported last year. A quarter of them mention drugs or alcohol as a trigger.